This might appear to be a couple of down-on-their-luck graffitti taggers. Unable to afford spray paint, they’ve been reduced to using tape to mark their territory. However, I happen to know these ladies; they’re actually school teachers, so maybe they’re making some kind of political statement through a performance of agitprop. 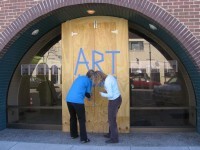 Deciphering the message, it seems clear that art is involved…so it probably has something to do with Art Crawl.